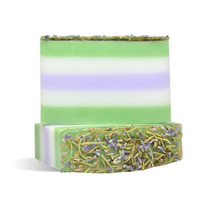 The relaxing and stress reducing effects of lavender coupled with the energizing and uplifting properties of rosemary creates the perfect balance of yin and yang in this simple melt and pour soap bar. Place silicone loaf mold on a cookie sheet. This will give mold stability when it is moved. Weigh 40 oz. of Premium Shea Butter MP Soap. Cut into small chunks and place in a large bowl. Weigh 2 oz. the Basic Clear MP Soap, cut into chunks and place in a second glass measuring cup. Weigh 1 oz. of Lavender Buds and 1 oz. of Rosemary-Botanical and place in a bowl. Gently mix together. Place 8 oz. of the Premium Shea Butter Soap chunks and place in a glass measuring cup. Add a small sliver of the Woodland Green Soap Color Bar. Heat in microwave until soap has completely melted. Mix with spatula or spoon to blend in the color bar. Soap should be a nice light minty green color. Add 1 ml of the Lavender Essential Oil and 1 ml of Rosemary Essential Oil and mix. Pour soap into the Regular Loaf Silicone Mold. Spritz top of soap with alcohol to release any surface bubbles. Place mold in freezer for 10 minutes to set up. Heat another 8 oz. of shea butter soap in microwave until soap has melted. Add 1 ml of Lavender Essential Oil and 1 ml of Rosemary Essential Oil and stir to incorporate. This layer will remain white. Remove soap from freezer. Spritz top of soap with alcohol to ensure the layers will stick together. When soap temperature has cooled to 125°F, pour over green layer. Spritz with alcohol and place back into freezer to harden. Heat another 8 oz. of shea butter soap in microwave until melted. 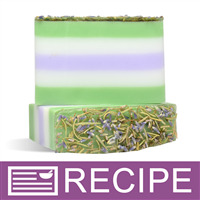 Add 1/4 of the Matte Lavender Soap Color Cube and stir into the melted soap. Heat soap further if the color bar has not melted completely. Add 1 ml of the Lavender Essential Oil and 1 ml of Rosemary Essential Oil and mix. When soap temperature has cooled to 125°F, pour over white layer. Spritz with alcohol and place back into freezer to harden. Repeat above steps 7-10 for next layer (white). Repeat above steps 11-14 for top layer (green). Do not place in freezer but let soap harden at room temperature. After top layer has hardened, heat the 2 oz. of Basic Clear MP soap just until melted. Check that soap temperature is at or below 125°F, then spritz the top of soap loaf with alcohol. 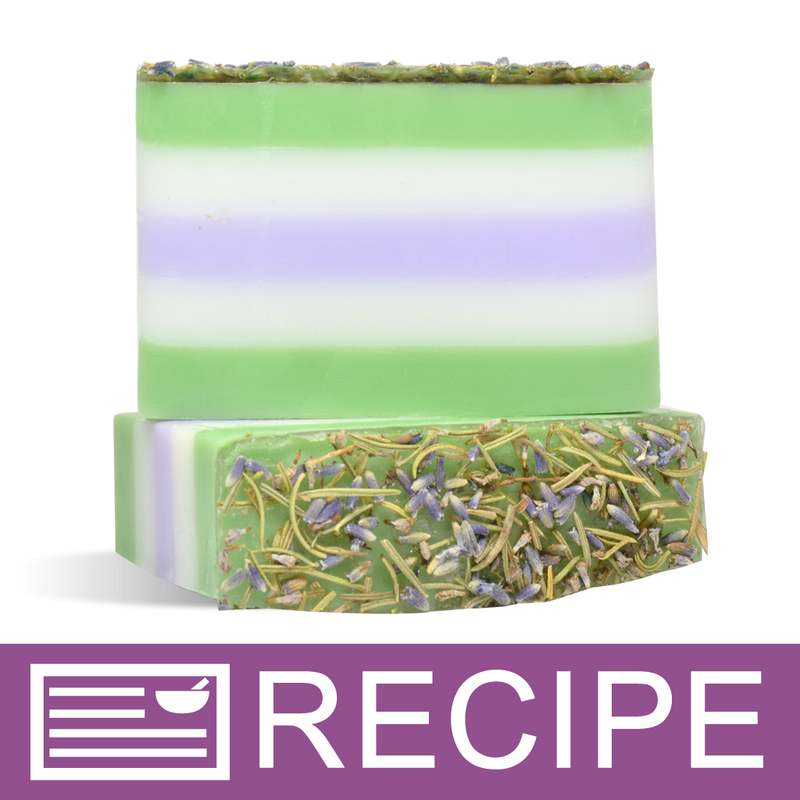 Pour the clear soap over the top and immediately sprinkle on the lavender and rosemary blend to decorate the loaf. Let soap completely set up. Remove soap from mold and slice. Wrap in plastic wrap or packaging of choice. Ingredient Label: Sorbitol, Propylene Glycol, Sodium Laureth Sulfate, Stearic Acid, Water, Sodium Hydroxide, Myristic Acid, Lauric Acid, Shea Butter, Titanium Dioxide, Glycerin, Lavender Essential Oil, Rosemary Essential Oil, Chromium Oxide, Ultramarines, Lavender Flower, Rosemary Leaf. "Could the lavender buds be mixed into the soap? " Staff Answer When mixed into the soap, lavender buds turn brown. We chose t use them only on the tops to maintain their natural color.